The implementation projects pick up on the findings from research and transfer these to practice. They bend a bow between the dangerous processes (e.g. Storms, Hail, Floods) on one hand and the damage potential as well as the vulnerability of potentially exposed objects on the other hand. It is a risk-based approach. The implementation projects shall benefit the transfer of knowledge between research and practice (and vice versa) and are conducted in collaboration with partners from Science, Administration and Practice. A risk-based, comprehensive approach to natural risks entails providing extensive information to the public. Even today, the dangers of flooding are illustrated primarily using 2D maps or films depicting simulations. But maps cannot bring these dangers truly to life – historical photographs of floods, available through a collective repository, do this much better. In addition, maps are difficult to read for many people. We believe that non-specialists would be better able to comprehend the dangers of flooding if presented with 3D and virtual-reality simulations. These aids would be used where no historical photographs exist to show what did and could again happen. Visualisations are also helpful for communicating what future events might look like. A feasibility study recently completed by the Mobiliar Lab for Natural Risks used two different technologies to create 3D flood simulations and test whether real-life applications are viable. The first simulation was based on a web framework compatible with any current browser while the second simulation was generated using a game engine requiring the installation of a special programme. Although both technologies presented advantages and disadvantages, the feasibility study concluded that the web framework is preferable for most future 3D applications. Several components, such as digital elevation models, orthophotos and swissBUILDINGS3D, are easily integrated, and the web framework is able to accommodate any size geographical region. Moreover, the application can be used on various end devices as it is browser-based. The feasibility study demonstrated that 3D visualisations of floods are relatively straightforward to generate if one has the relevant knowledge and proper prerequisites. And because they portray what the reality of a flood looks like, they are a suitable means of informing and raising awareness among the public. Fig.1: Screenshots of each 3D visualisation illustrating the same flood. On the left is the result generated by the web framework and on the right, that of the game engine. Since the early 19th century, river engineering measures have transformed the Emme from a broad, shallow watercourse to a highly channelled river with a deep river bed. Its surface area is now less than half of what it used to be. Not only the river itself, but also its surroundings underwent substantial changes, impacted by the development of settlements: the number of buildings has increased from some 600 in 1820 to approximately 6,500 today. Fig. 1: The settings allow users to explore four factors: settlement, river course, extent of flooding and impact of climate change. 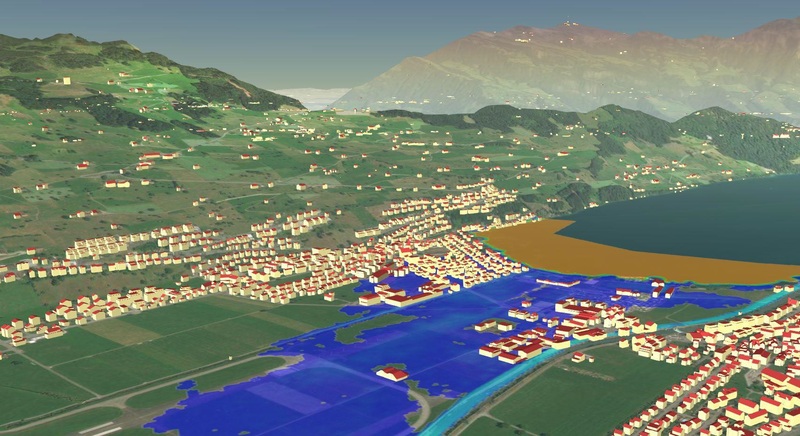 The flood risk of a simulated scenario is shown through the illustration of flooded areas as well as an amount given in Swiss francs. An interactive map available at www.risikodynamik.ch lets users explore each factor influencing flood risk separately. Isolating factors like this, enhances the appreciation of the impact that each one has on the potential damage and risk of floods. Control structures have sharply reduced flood risk from 1820 to 2016, with flood-protection works currently protecting 1,305 buildings. However, users can also see that settlement growth has significantly increased the potential for damage and, consequently, flood risk. According to a simulation generated by the interactive map, flood risk has been approximately cut in half overall since 1820. Users can also see the potential impact of climate change on flood risk, with a tendency towards more frequent and larger-scale floods. This, combined with anticipated settlement growth, will likely cause flood risk to continue increasing in future. Forward-thinking land-use planning prevents sharp increases in flood risk, which can also be reduced through additional protective measures. In Switzerland, floods regularly cause damage running into millions. The Confederation, cantons and municipalities spend hundreds of millions of Swiss francs each year to protect the population and property from flooding. 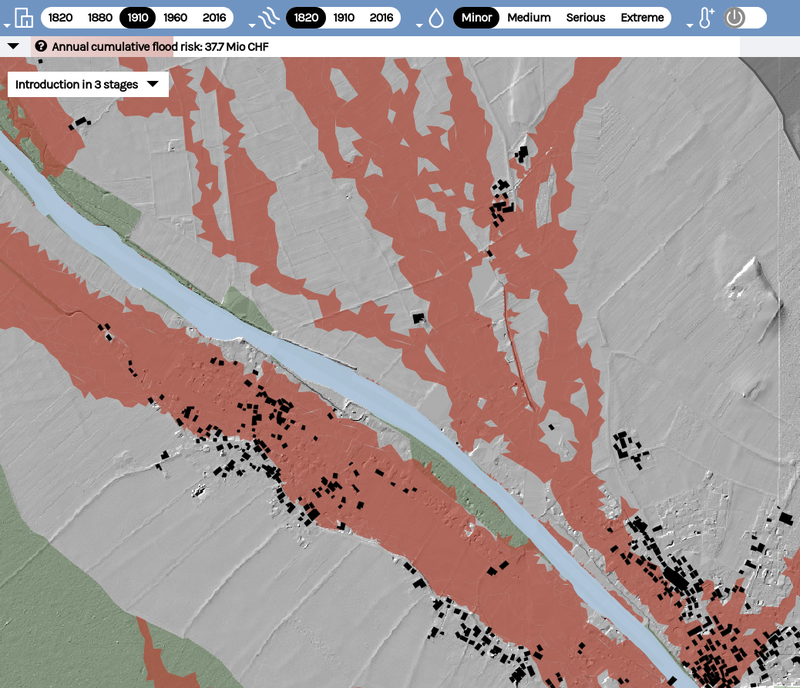 The flood hazard maps show with high spatial resolution where, how often and how intensively flood events can occur. If the hazard maps are spatially analysed in combination with socio-economic data such as population figures or building values, it is possible to estimate the focus of future events. And this information in turn helps to determine the need for protective measures and to prioritise them. With various analysis tools, the absolute and relative values of the flood-prone objects of protection can be easily compared with each other. Fig. 3, left: Percentage of workplaces at risk of flooding at the location / neighbourhood level. The colour scale ranges from dark red (100 %) to orange (25 %) to blue (0 %). Fig. 4, centre, right: Overview showing the flood-prone objects of protection for a specific location or neighbourhood. The network diagram (right) can also be used to determine whether the hazard is higher or lower than the community average compared to the municipality in which the site or quarter is located. The interactive website www.ueberschwemmungsgedaechtnis.ch provides free access to images of floods throughout Switzerland. Images are both taken from existing archives and provided by the public. The collection is therefore expected to grow steadily. There are several objectives behind this approach. Firstly, it reminds the public that floods are indeed a pertinent danger. Secondly, photographs of past floods enable researchers to validate flood simulations. Lastly, they help specialists assess hazards in real-life situations. Each photograph is geolocated on a map of Switzerland and provides additional information such as its source and possible further use. Users can search for photographs of floods by their location or time period. Uploaded images are manually validated at the Mobiliar Lab, after which they are posted on the website. Why not contribute your own flood photos to help raise public awareness and aid researchers? What proportion of total flood damage affects household contents? As a result, how vulnerable are they? To find the answer to these key questions, this study analysed real-life claims to develop basic principles and methods for including damage to household contents in risk assessments. To clarify the terminology used, household contents fall under the category of moveable property. Vulnerability or loss severity refers to the proportion of damage relative to the property’s total value. While the loss severity of household contents is generally higher than that of buildings, household-content losses often do not exceed the building losses. This is not surprising, given that the insured sum of buildings is on average six times the value of household contents. As a result, heavily damaged household contents are equal to a lightly damaged building. 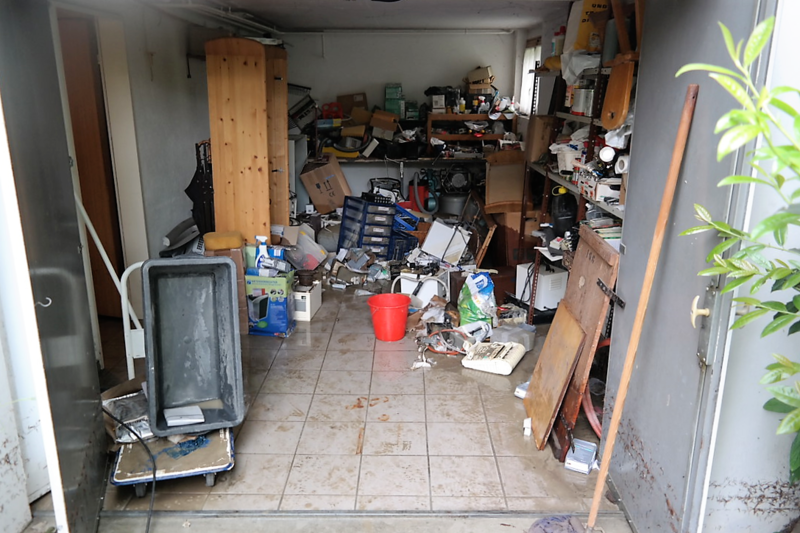 In the cantons of Obwalden, Ticino, Uri, Schwyz and Valais, the proportion of damage to household contents was on average 20-32% of total damage – a substantial portion. Consequently, risk and cost-benefit assessments performed for flood-protection projects should contain additional information explaining whether and how damage to household contents should be taken into consideration. The analysis conducted during this study linked Swiss Mobiliar insurance company building and household-content data from the previously mentioned cantons. The project’s primary output will be a feature to calculate the vulnerability of household contents or moveable property when assessing risk. The method will be made available on www.mobiliarlab.unibe.ch shortly. Large woody material transported by rivers during floods can be jammed in naturally or artificially narrowed stream sections. This often leads to a dramatically increase of the destructive power of the flood and can cause severe damages and high costs. It is important to consider these processes in risk managements, especially with regard to extreme events like the flood in August 2005 during which more than 110’000m3 of woody material was recruited and transported in rivers. In Berne alone, a clogging of the Mattenschwelle led to backwater effects and to inundations of the Matte district with damages of over 50 Mio. CHF (Bezzola & Hegg 2007). Since direct observation of these processes are difficult and rare, numeric modelling is a promising alternative. The here presented model “LWDsimR” is an adaption of the model of Mazzorana et. al. (2011) and enables a vector based and object-oriented simulation of the woody debris dynamics during floods on the basis of irregular meshes and hydrodynamic 2D inundation models. Mobilization, transport, deposition and entrapment of the woody material can be modeled with temporal and spatial high resolution. This allows the identification of possible recruitment areas, transport pathways, deposition areas and critical stream configuration for log jams as well as an estimation of the expected volume of the woody material. The R programming-based code of the model is open source and can be downloaded on Zenodo (including istructions) or using the direct link (only Zip file). Furthermore, scripts for the pre- and postprocessing of the data as well as a sample dataset are available. Detailed information for the use of the model as well as for the preparation of the required data and evaluation of the results are given in the Professional Article (PDF, 3.6 MB) and the User Manual (PDF, 1.0 MB). A detailed description of the model and the transport equations can be found in Mazzorana et al. (2011). For the vector-based version in R, see Zischg et al. (2018). Zischg, A.P. ; Galatioto, N.; Deplazes, S.; Weingartner, R.; Mazzorana, B. Modelling Spatiotemporal Dynamics of Large Wood Recruitment, Transport, and Deposition at the River Reach Scale during Extreme Floods. Water 2018, 10, 1134. https://doi.org/10.3390/w10091134. In autumn 2018, the publication "Tools for surface runoff as a natural hazard - a decision-making aid", prepared by Mobiliar Lab für Naturrisiken, was published. Its main objective is to support experts in the selection of suitable tools for the assessment of a concrete case. After explaining the current state of knowledge on the subject, the handbook presents the central decision-making scheme (see illustration), which characterises the eight tools in terms of purpose, industry and effort. The tools are then presented individually using a fact sheet. Finally, their application is illustrated by means of a typical question in an exemplary, joint field of study. Abb. : Excerpt from the decision scheme, the starting point for the various tools that can be used for different questions on the subject of surface runoff. In each publication, the authors present tools that they have largely developed themselves. The contributions were prepared by the Mobiliar Lab für Naturrisiken, Agroscope, the geo7 office and the Vereinigung Kantonaler Feuerversicherungen, VKF. The following tools are part of the handbook: hazard map of surface runoff, erosion risk and water connection map, selective hazard assessment, modelling of phosphorus losses, fine-scale modelling of surface runoff, toolbox for damage data classification, observation data of surface runoff events and building protection measures against surface runoff. An additional, rather surprising element for a specialist publication is a contribution by the Swiss artist Ester Vonplon. Her photo series is placed in the middle of the book as an insert. This artistic contribution is intended to provide readers with an access to the subject that goes beyond scientific debate. It encourages all of us to reflect by raising the question of how we will deal with nature in the future. The decision aid Surface runoff is available in book form as well as a PDF file. It was published in the series "Hydrology of Switzerland". It is published by the Swiss Society of Hydrology and Limnology (SGHL), the Swiss Hydrological Commission (CHy) of the Swiss Academy of Sciences (SCNAT) and the Mobiliar Lab für Naturrisiken. The book can be ordered from CHy. The PDF file can be downloaded from the links below. „Monitoring flood risk in Switzerland“ is a research project by the Mobiliar Lab for Natural Risks and the Federal Office for Environment of Switzerland FOEN. The project aims at connecting science and practice and is funded by both participating institutions. The ongoing pre study provides a “state of the art” concerning monitoring of flood risk in science and in political context likewise. Focus of the study is the gathering of existing knowledge, as well as (not yet) implemented instruments and methods regarding flood risk monitoring. Based on the findings of this pre study, research questions, aims and methods of the following main project will be further specified. In Switzerland, flood events are causing damages running into the millions. Thanks to hazard risk maps, it is known where floods can occur. Yet, how many buildings are located in flood risk areas, what’s their value, and how many people live in these buildings? The Mobiliar Lab for Natural Risks of the University of Bern has addressed these questions and developed the website www.hochwasserrisiko.giub.unibe.ch/ : it shows based on the hazard risk maps, the populations potentially at risk or buildings and building values per community, district and canton. Throughout Switzerland 270’000 buildings with a total reinstatement value of 480 billion Swiss francs are located in flood risk areas, inhabited by about 1.1 million people. Looking at the percentage of affected people or buildings by the total population or building stock, the Alpine arch (e.g. Valais, Nidwalden and “St. Gallen Rheintal”) is highly threatened. If focusing on the number of threatened people and buildings, the Central of Switzerland and the cities (especially Zurich, but also St. Gallen, Biel or Lucerne) stand out. The most affected areas – in terms of percentage and number of threatened people and buildings – are the Rhône Valley (VS), the Interlaken region, the region surrounding the Lake Lucerne, the “Linthebene“ (GL, SG, SZ) and the “St. Galler Rheintal”. Needs of the population to app-based weather warnings and behovioral tips as a basis for optimizing the communication of storm warnings. The Mobiliar Lab für Naturrisiken and the Federal Office of Meteorology and Climatology (MeteoSwiss) have tested a new short-term hail warning in the years 2015-2018. The hail warning has improved significantly over the last 4 years. The results of the project will be further analysed and hail research will be further promoted so that even more precise hail warnings can be sent in future. What makes flood protection projects successful? The Mobiliar Lab for Natural Risks evaluated 71 Swiss flood control projects concerning their planning and effectivity. The aim was to gain insights into project procedure and benefits of flood protection projects and risk development. 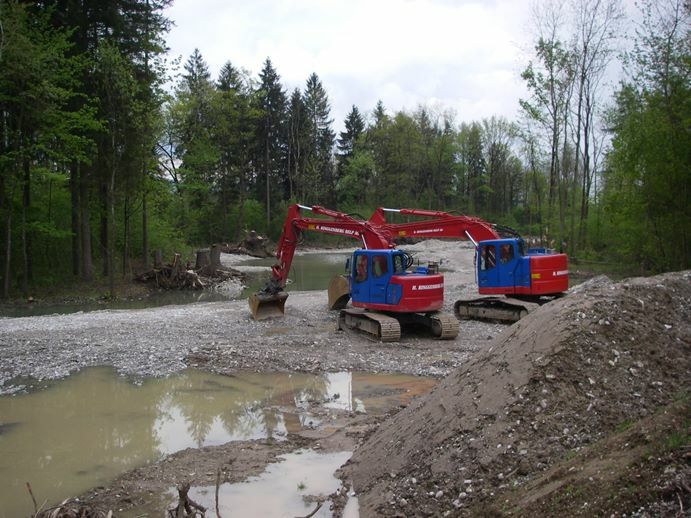 This report evaluates the role and perspective of Swiss communes in the process of planning and implementing flood control projects. The assessment focuses on the three main aspects project procedure (project initiation, involvement of insurance companies), benefits (economic, ecologic and social) and risk (risk-based approach, risk development). Based on these three main aspects we explore what makes a successful flood control project. To answer this question, we analyzed 71 Swiss flood control projects by evaluating technical reports, online-surveys and interviews with communal project managers. Finally, the communes' perspectives were contrasted with the positions of other important stakeholders of Swiss flood control management. Flood control measures are mostly being planned and implemented in response to flood events. Generally, the planning of the physical flood control measures is not linked with organizational or spatial planning measures to reduce the flood risk. Tools and approaches to combine flood control with ecological-, economical- or social co-benefits are available but not fully exploited. The assessment shows that flood control measures lead to a risk reduction in the protected perimeter in the short term. However, the risk development in Switzerland (increasing population and construction activity etc.) flood risk is likely to increase in the future. In Swiss flood protection the influence of insurers and other third parties is negligible. Nevertheless, financial support of third parties for flood control measures may help to accelerate project progression. To make a successful protection project it is important to include all stakeholders at an early stage and to enhance the exchange of information among them. Additionally, the integration of spatial (watershed management, coordination of up- and downstream land owners etc.) and secotral (urban drainage, revitalization, recreation) aspects should be promoted as it verifiably creates strong co-benefits. Furthermore, to be able to move from an event-based to a risk-based strategy, an appropriate basis is required. Thereby, insurers with their expertise related to the development of risk monitoring tools may play an important role to secure the envisaged security level of flood protection in the long run. Preparation of a Swiss-wide hazard map for winter storm based on data series of the last 150 years under the leadership of FOEN and MeteoSwiss. A national hazard map for hail was drawn up and the results published: http://dx.doi.org/10.1002/qj.2771. Users report hail observations via the MeteoSchweiz-App and thus make a major contribution to hail research. The reported hail observations close a gap between the weather radar hail algorithms and the hail sensors installed in spring in the "Swiss hail monitoring network" project. Investigation of the relationship between hail activity on the radar and damages to passenger cars. Development of a method for the preparation of maps of the hail activity of the pervious day. Preparation of a spatially and time-resolved data collection of damages and inventory data as a central foundation for current and future projects.